Our project has organized in the past years a number of research seminars. In addition to our main project seminar, we were responsible with the organization of the seminar in logic, history and philosophy of science (CELFIS seminar). The CELFIS seminar is a weekly research seminar, taking place every Wednesday from 6 pm in the Faculty of Philosophy. Since January 2017 we are also organizing the CELFIS Graduate seminar. The CELFIS graduate seminar will take place on Wednesdays from 4 pm in the Faculty of Philosophy (Amphiteater Titu Maiorescu). In the second part of 2015 our main activity at the research seminar was working on the Translation project 2, the selection of fragments for the three volumes of philosophical cosmology (fundamental texts). We have read and investigated texts selected for volume 1 (Philosophical cosmology in the Renaissance) and volume 2 (Cosmology in Early Modern Europe), ranging from mid sixteenth century mixed mathematics and treatises on the sphere to late seventeenth century and the beginning of the eighteenth century. In November 2015, volume I (Philosophical cosmology in the Renaissance) has been submitted to the publisher. For a short summary of volume I see here. 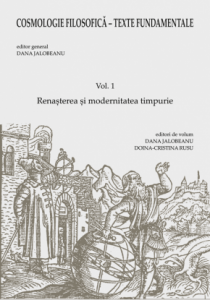 Volume I is co-edited by Dana Jalobeanu and Doina-Cristina Rusu. In the recent Bran seminar, the Bucharest-Princeton Seminar in Early Modern Philosophy (12-17.07.2015), our research team was well represented. We continued to explore the multi-faced transformations of the early modern science, discussing how experiment, mathematics, metaphysics, natural histories, theology, and metaphysics came together into the discourse of the new science of the seventeenth century. Such a discussion took place in the reading group on “Genesis and the new science. The case of Cartesian philosophy,” which was coordinated by Mihnea Dobre (University of Bucharest) and Daniel Garber (Princeton University). Mihnea Dobre: In the reading group, we discussed various texts from the Philosophical Transactions, Descartes’s correspondence, fragments from Descartes’s writings, and a book written by the Cartesian Géraud de Cordemoy. All the selected fragments concerned the relation between the new philosophy of the seventeenth century and the scripture. In particular, we focused on the relation between the corpuscularian theories advanced by Descartes and his followers and the first chapter of Genesis. In 1670, the Philosophical Transactions presented two recent books that were dealing with the mosaic history of creation. These books were written accordingly to the new mechanical philosophy and they revealed obvious links with Cartesian philosophy. One of the main claims Oldenburg made in these books was that the story presented by Moses in the Genesis 1 was explained philosophically by the new science. Moreover, as one can learn from the review of the Cartesius mosaizans, they claimed that corpuscles and laws of motion are all that God had to create and the world was set into existence. As the title of the book suggests, this reading was inspired by Descartes’s natural philosophy. However, Descartes did not manage to give himself a full account of this issue. In the reading group, we explored the various places – especially from Descartes’s correspondence – were he referred positively to the explanatory power of his philosophy, which would include an account of the mosaic history of creation. In any case, his claims were defended and further developed by his philosophical heirs. We referred to one of these accounts, Géraud de Cordemoy’s Letter to a learned friar…. By exploring this connection between Cartesian natural philosophy and the Biblical history of creation, our reading group raised important questions about the relation between philosophy and theology, reason and revelation, history and observation. For Bacon, spirit in general is a “breath compounded of an airy and a flamy substance” (OFB VI 321). One extreme is that of the air (rather cold and inactive), the other that of fire. But the mixture of air and fire is not mechanical (OFB XII 355); it is a complete mixture (which cannot be simply evaluated in terms of more air/less fire; or more fire/less air, but has a ‘mysterious’ character, OFB XII 352, 376 etc.). In between ‘air’ and ‘fire,’ we have a whole range of spirits: the non-living ones “are nearly consubstantial to air,” while the “vital spirits come closer to the substance of fire.”(OFB XII 354-5) One fundamental principle in Bacon’ natural philosophy is that there is no tangible body devoid of spirit. By contrast, spirits can be ‘free’ or ‘enclosed’ in matter. Meanwhile, spirits also come in all sorts of shapes and forms: and although Bacon sometimes attempted classifications of pneumaticals (i.e. according to their rarity in HDR) it is clear that their diversity resist any form of unique classification. In the late natural histories, one can find series of experiments which seem to attempt to classify pneumaticals according to their properties. In some cases, the classification takes into consideration observational properties of pneumatics (hence, the resulting ‘classification’ will be called ‘phenomenological’). In some other cases, (esp. Sylva) the principle of classification seem to be the prevailing process (i.e. physical classifications). There is arguably also an attempt to divide spirits and matter in metaphysical terms. It is not only that these classifications are not unique, they are also overlapping. However, the recurrence of such attempts to classify spirits in the late natural history seem to signify that Bacon was persuaded of the importance of achieving some form of classification, or typology of pneumatic substance. Classification of spirits according to the qualities of the mixture of air and flamy (which gives it empirical characteristics such as “greediness,” “lassitude” …). Spirits “weak” “clinging loosely, … practically consubstantial with plain air,” “dwelling mainly the outer parts of the body. ;” “transient guests” in bodies – Versus spirits “stronger,” “further inside,” “submerged and buried deeper in the solid parts of the thin.” (OFB VI 291) Also, there is a rule in HVM which links the even/non-even distribution of the spirit with its properties/activity – abundance of spirit non-evenly distributed makes the spirit more predatory OFB XII 361. HVM: Rule/Canon IV: In all living things there are two kinds of spirits: non-living ones (Mortuales) of the kind found in inanimate substances, and the superadded vital spirits. Vital spirit is something different from all the spirits that exist in inanimate bodies because: it needs aliment, it is somehow closely connected with the body (being ‘in charge’ of the body and all the other spirits), it ‘rules’ the other spirits and the body. Of composition (all spirits are a mixture of air and flame, and the living one are closer to the nature of flame, but Bacon emphasizes that this is not a mechanical mixture and hence “when this rule states that vital spirits come closed to the substance of flame, it must be taken to mean that they do so more than the non-living ones, and not that they are more flamy than airy” (OFB XII 355). Hypothesis 1: As with many of his new concepts, Bacon seems to use “spirits” in more than one way; using a range of traditional, loose meanings (spirits are the breath of life, they are the source of activity in the Universe and they originate “in the stars,” there are living spirits and non-living spirits etc.) and a more specific, technical meaning (a class of material substances characterized by rarity, heat (potential or actual heat), active powers, the capacity to diffuse at considerable distances, and other several properties such as greed which Bacon attempts to express in terms of combinations of attributes). Hypothesis 2: There are small but significant differences between DVM and HVM on the one side and SS on the other regarding the fundamental and derivative properties of pneumaticals. These differences can originate in the fact that in SS Bacon asks different questions and is interested in different aspects of the workings of spirits than in the other two works. Thus, there is no equivalent of spiritus mortualis at work. Meanwhile, there seem to be a distinction between the principal spirit of a body and other spirits which might (or might not) inhabit the same body. The principal spirit can be the living spirit of DVM and HDR. Meanwhile, there clearly are other organized spirits at work in the same body (a scion grafted on a stock poses this problem of two principal spirits ‘fighting’ and one is overcoming the other). Much has been written about seventeenth-century experiments and experimental philosophy. My paper for the CELFIS seminar of October 8 aimed at engaging with that tradition. In particular, I was concerned with the recent discussion by Peter Anstey of the so called BBH model of the experimental philosophy (BBH stands for the name of Bacon, Boyle, and Hooke). As a reaction to Thomas Kuhn and Peter Dear, Peter Anstey’s article provides a very nice introduction into the Baconian experimentation and its main developments in the second half of the seventeenth century. Both Boyle and Hooke engage with a form of experimentation that is labelled here “Baconian.” It is not, however, the purpose of this small blog post to engage with the details of Anstey’s article, but rather to try to complement his analysis with a new example of experimentalism that can be found in a completely different source. This is the case of the experimental work of the Cartesian natural philosopher, Jacques Rohault. In my lecture, I’ve referred to two experiments that were performed by Rohault: with pneumatic devices, on the one hand, and with glass drops, on the other hand. It is well known that Boyle was the main contributor to the pneumatic or baroscopic experiments of the 1660s. Hooke was among the first to examine glass drops and to provide an explanation for both the production of the small glass objects and for the curious phenomena produced by those. Interestingly, Rohault deals with both of these issues in experimental terms. Now, one might very well wonder why is important that a Cartesian philosopher was providing an explanation for some intriguing experiments; after all, he is a Cartesian, therefore a speculative philosopher (see the Otago blog here and here), and he would explain all phenomena according to the principles of Cartesian physics. Yet, this classification of seventeenth-century philosophers into “experimental” and “speculative” should not be an impediment in searching for explanations in one’s writings. But there is more than that and I argued in my paper that it is precisely Rohault’s experimental approach to the study of the two phenomena that would make difficult to draw a clear boundary between his work and the works of the most representative experimenters of the BBH model. I have argued elsewhere that Rohault treats the study of the properties of the air in experimental terms. He does not simply jump from the conclusions derived in the general part of Cartesian physics (which is most often claimed that he does), but actively engage in experiments and observations. With respect to the study of glass drops, Rohault is also concerned to perform all the needed observations before providing an explanation. This is also what Hooke did in his Micrographia. As a tentative conclusion for this very sketchy blog-post, I claim that based on these two experiments, Rohault should be placed in the same context with Boyle and Hooke, so as a representative of the BBH model. If, on the contrary, one would like to point to his “Cartesianism,” then, one simply overlooks his experiments and this would raise new worries for the use of historical categories: if one dismisses some experimental practices only on the basis of placing the practitioner to one or another camp, then, the problem is not any more with the use of experiment in natural philosophy, but with the way various natural philosophies of the period were classified in our histories. In the mid-seventeenth century, the problem of vegetable philosophy was very much debated inside the Hartlib Circle. Samuel Hartlib, the center of a wide circle of correspondents, acted as a publicizer, sharing, printing, and even budgeting a significant number of interesting and novel ideas, and in this way helping the wider dissemination of inventions and ideas. In 1650 Hartlib turned his attention from ecclesiastical and pedagogical projects to husbandry and vegetable philosophy. What exactly is vegetable philosophy? And what is its relation with the tradition of husbandry? This field of study does not have a place in today’s classification of knowledge. It is not botanic, because its objectives are diverse (metals, stones, natural ores). It is not just agriculture, because it has a manifested inclination for alchemical experiments. And, to complicate things even further, it is not simply natural philosophy, because it has a practical and operative side, concerned with technological advancement and amelioration. Vegetable philosophy emerged inside the Hartlib Circle and has been used to define a new field of interest, which could connect alchemical interests, extraction of metals, natural magic, cultivation of the land, the Baconian tradition of experimentation and dedication to the open character of knowledge and benefit of mankind. Vegetable philosophy is essentially technological and anti-speculative, experimental and operational, orientated towards production of specific results, recipes, and technologies transferable form one situation to another and even from one domain to another. Which is the relation between husbandry and vegetable philosophy? Is vegetable philosophy just a sub-domain of husbandry (along with other sub-domains such as botanic, agriculture, metallurgy)? Or knowledge of husbandry is a prerequisite for vegetable philosophy? Austen, R., Observations upon some part of Sr Francis Bacon’s Naturall History, as it concernes fruit-trees, fruits, and flowers …, Oxford, Hall for Thomas Robinson, 1658, Dedication To the honourable Robert Boyle Esq. sonne to the Lord Boyle of Corke. “It is strange how the ancients took up experiments upon credit, and yet did build great matters upon them. The observation of some of the best of them, delivered confidently, is, that a vessel filled with ashes will receive the like quantity of water that it would have done if it had been empty. But this is utterly untrue; for the water will not go in by a fifth part. And I suppose that that fifth part is the difference of the lying close or open of the ashes…” (Sylva Sylvarum, SEH 34). – What type of measurements does Bacon employ? – What type of quantities or qualities is subjected to measurement by Bacon? – What other examples of Bacon’s measurements can be represented by such tables? – In what theoretical cases is measurement invoked? – How important is the exactitude in the measurements? – When does measurement help in constructing an argument and when does it help in rejecting other’s arguments? – Is measurement an effective tool in building up the theory of matter? – Is measurement used independently of Bacon’s theory of matter? The examples of measurements Sylva Sylvarum presents can be a good starting point for the discussion of these points. Different answers to these questions can also set the stage for a comparative analysis between Bacon’s use of measurement and other philosophical treatments of it. We would love to hear your comments, suggestions and thoughts on these matters, so please leave us a comment. A while ago, in the Scientiae 2013 conference-panel on “Francis Bacon’s Art of Discovery: origins and development,” I’ve raised the problem of talking about “Baconianism” in the second half of the seventeenth century. The context discussed in that paper was that of the French Cartesianism, a very implausible source for such a discussion, if we are taking seriously the traditional stories about the seventeenth-century thought. The cases discussed in that paper – Nicolas Poisson, François Bayle (via Samuel de Fermat), and Descartes himself – reveal an interesting approach to “Baconianism,” which I would like to complement in this blog-post with several new questions. More recently, in a panel-discussion at the 4th Bucharest Colloquium in Early Modern Science, I’ve asked some questions about Mersenne’s early reception of Bacon’s views on method. In 1625, Marin Mersenne published his treatise on La Vérité des sciences, which, in the ch. 16 of Book 1 deals with Bacon’s method. From the text, Mersenne’s sources seem to be Bacon’s Great Instauration and The Advancement of Learning. Mersenne’s first objection to Bacon is that most of the things he says are not needed or insufficient. Mersenne explicitly refers to medicine as refuting Bacon’s views: “il se trompe en plusieurs choses, comme quelques excellens Medecins ont reamarqué, lors qu’il parle de la Medecine, & qu’il dit que l’histoire, & l’experience de plusieurs choses qu’il nomme, n’a point encore été faite” (p. 209). Why would medicine come to represent such a clear evidence against Bacon’s views? What kind of medicine is discussed here? There are various objections raised by Mersenne to Bacon, but for this blog-post, I would like to point only to another passage, where he praises the Englishman’s experimental activity on/ with animals, vegetables, and different materials of alchemical use: “Ce que je trouverois bon en sa doctrine, est qu’on feît toutes sortes d’experiences pour découvrir comment les esprits des plantes, & des animaux exercent leurs operations: & leur multitude: comment & par quelle vertu les eaus Royalles, fortes, & toutes celles que l’Alchymie nous donne, dissolvent l’or, l’argent, le cuivre, l’étain, le fer, & les autres métaus, & mineraus: porquoy elles ne dissolvent pas le verre, les pierres, les plantes, &c.” (p. 211). Why is Mersenne highlighting these aspects? Is this because Bacon picks up some experiments and practices from outside of the philosophical domain and adjusts them as proper philosophical problems? If this means doing experiments on all sorts of materials, to which one has to try various operations – in other words, variation both within the materials involved and in the experimental procedures – something that has been done by other natural philosophers (and craftsmen) of the early modern period, then what makes it “Baconian”? And as a final question, these passages seem to suggest that Bacon’s experimentalism says something to his seventeenth-century contemporaries when he talks about medical and alchemical problems. Why are these two disciplines receiving more emphasis in the reception of Bacon’s views rather than other philosophical disciplines? In parallel with our translation project, the first year of 2013 will be dedicated to the exploration of the sources of Sylva Sylvarum. Each member of the team will work on particular strings of experiments, trying to trace their sources, the background knowledge and the questions they are supposed to answer/pose. Each week the team will meet and discuss particular experiments (strings of experiments) and their presumptive sources. Such an investigation has both historical and philosophical relevance. Identifying Bacon’s sources is of a vital importance for a scholarly edition of Sylva Sylvarum and our project needs to perform this investigation. However, even more relevant is the philosophical problem of Bacon’s sources. Clearing Bacon’s name from accusations of plagiarism it is not enough to understand the way he dealt with sources. Spedding and Ellis have identified some of the sources of Sylva Sylvarum (although by no means all, as Rees’ has shown in his seminal paper). They have not, however, compared the handling of “observations” and “experiments” in the “source” and in Bacon’s text. As a result, they sometimes failed to see, for example, that in many of the places where Bacon “borrows” from Della Porta, he suggested experiments meant to refute Della Porta’s claims or even to refute Della Porta’s experimental findings. In some other places he begins with a question or suggestions “borrowed” from Aristotle Problemata only to move the direction in a completely different direction. Francis Bacon’s handling of the sources is very similar with the common-place book tradition. It is consistent with his own belief that natural history begins with reading and collecting stories, facts and observations from books. Such facts, observations, ideas etc. are then the starting point in the activity of the experimenter. In this way, the “sources” are not so much Aristotle, Della Porta, Cardano, Pliny etc. but Bacon’s own Kalenders of doubts and Kalenders of problems: common-place books with collections of problems, questions, doubts, ideas etc. to be treated as starting point for natural history. As a result, he recommends certain catalogues, collections of Kalenders of doubts. As for the calendar of problems, Bacon indicates that a good exemplar of such a “kalender” is Aristotle’s Problemata. Such calendars of doubts and problems are gathered from books and they have to be supplemented with an interesting calalogue of opinons (errors). How to gather such a catalogue? To which Kalender of doubts or problemes, I advise be annexed another Kalender as much or more Materiall, which is a Kalender of popular Errors, I meane chiefly, in naturall Historie such as passe in speech & conceit, and are neverthelesse apparently detected & convicted of untruth, that Mans knowledge be not weakened nor imbased by such drosse and vanitie. As for the Doubts or Non liquets generall or in Totall, I undertand those differences of opinions touching the principles of nature, and the fundamentall points of the same, which ahve caused the diversitie of Sects, Schooles, and Philosophies, as that of Empedocles, Pythagoras, Democritus, Parmenides, and the rest. In other words, acccording to his own theory in The Advancement of Learning Bacon is interested in two things when reading: to identify problems and “doubts” from where investigation of nature can begin afresh and gain momentum; and to identify, classify and study various philosophical errors (in dealing with the facts and phenomena of nature). My suggestion is that the way Bacon deals with his sources in Sylva Sylvarum is an application of this theory. This is the working hypothesis I propose for our next few encounters. [i] Bacon, F., Works, vol. II, 326. [ii] Rees, G., “An Unpublished Manuscript by Francis Bacon: Sylva Sylvarum Drafts and Other Working Notes”, Annals of Science 38 (1981):377-412, 388. Peter Harrison’s book The Fall of Man and the Foundations of Science (Oxford University Press, 2007) brought forth a very attractive thesis for the explanation of the origins of early modern philosophy, namely the idea that the interest for the natural philosophy primarily emerged from anthropological preoccupations and not from epistemological concerns. The thesis championed is that, due especially to Protestant influence, the concerns regarding early natural philosophy were determined by the aim to vindicate the dramatic consequences the Fall had upon human capacities. More exactly, the argument goes, ‘The experimental approach [forming this natural philosophy]… was deeply indebted to Augustinian views about the limitations of human knowledge in the wake of the Fall…’ (p. 8). Despite the argument and the examples mainly refer to the English settlement, the thesis is taken to hold for Continental Europe too (pp. 4-5). A very interesting example for this is that of the Reformator Philipp Melanchthon (1497-1560), shortly presented in the 3rd chapter of Harrison’s book (esp. pp. 97-103). Melanchthon was one of Luther’s closest friends and the author of the first Protestant credal statement, expressed in the Augsburg Confession (1530). He had remarkable skills in Ancient Greek, a language that he taught at the University of Wittenberg, together with other courses on natural philosophy that he taught after he took upon himself the mission of reforming the curricula of the German universities (see Kusukawa, 1995). Melanchthon’s openness to the natural sciences (mathematics, medicine, astronomy, astrology etc) was partly determined by some events (Peasant’s War) occurring in his biography but also by his specific theological understanding of the Fall. Although he had the same opinion with Luther that the Fall destroyed the divine image implanted by God in man at the moment of creation, he nonetheless took a more positive stance with regard to the consequences of this event by postulating that some ‘vestiges’ of the divine light remained in the human soul under the form of principles or notions. He considered that these notions play the role of conditions for the possibility of attaining knowledge (Frank, 1995). Harrison is aware that these theological justifications for gaining knowledge through sciences coming from Melanchthon ‘is a slightly different perspective from that which will be developed by English Calvinists, for whom the scope of natural philosophy is itself determined by theological anthropology’ (p. 99). -what is the relationship between divine providence, inborn notions and the sciences in Melanchthon’s and also in his fellows’ thought? -what are the features of the method of astrology in Melanchthon’s reply to Pico della Mirandola? Harrison, P., The Fall of Man and the Foundations of Science, Cambridge: Cambridge University Press, 2007. Frank, G., Die Theologische Philosophie Philipp Melanchthons (1497-1560), Leipzig: Benno 1995. Kusukawa, S., The Transformation of Natural Philosophy: the case of Philip Melanchthon, Cambridge: Cambridge University Press, 1995. Kusukawa, S., (ed. ), Philip Melanchthon. Orations on Philosophy and Education, Cambridge: Cambridge University Press, 1999. Tredwell, K. A., The Melanchthon’s Circle’s English Epicycle, Centaurus 2006, 48 (1), pp. 23-31.